Statin drugs are some of the most damaging medicines ever invented, but the situation is especially grave because statins - they go under names such as Lipitor, Mevacor, Pravachol, Crestor and Zocor - are officially recommended by the highest health authorities as a "preventive" measure for heart attacks. 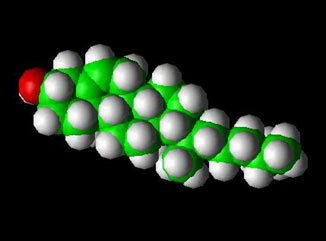 The Cholesterol Molecule - Image credit: World of Molecules. "I recently wrote a column about cholesterol-lowering medications. I stated that if 67 healthy men with elevated cholesterol took a cholesterol-lowering drug (from a class of drugs called statins) for five years, only one would benefit. The other 66 would not benefit, and it would cost about $5,500 over the five-year period." But that is not all - according to several experts, the decision to "lower cholesterol" has been a bad mistake. Take the fact that statins are the most profitable medicines of all times and rake in tens of billions of profits every year for their makers, and you have an idea of what the underlying motive for that decision ultimately might have been. For the past five years I have been talking about the importance of the mevalonate pathway and the inevitable problems to come from inhibition of this vital biochemical complex especially at its very beginning. Think of the mevalonate pathway as a tree with multiple branches and then think of the effect of our statins drugs as "girding" this tree at the base, in our misguided efforts to block cholesterol. Our pharmaceutical industry threw caution to the wind 15 years ago when our national priority to lower cholesterol so fogged our minds that we (medical, pharmaceutical and the food industry) focused just on the cholesterol branch of the mevalonate pathway and completely disregarded the important consequences of collateral damage to the other main branches of our tree from our statin drugs. The predictable result of all this has been our bizarre spectrum of statin associated side effects ranging from cognitive, to myotoxic, neurotoxic, neurodegenerative and even behavioral. When our powerful statins cut our cholesterol 50%, our CoQ10 is also likely to be cut a similar amount and therein lay the problem, for CoQ10 has vital roles in energy production, cell wall integrity and mitochondrial anti-oxidation, all of which leads to the enormous variety of symptoms and problems we now are seeing. And what about another major branch of the mevalonate tree, that of dolichol? Recently I have learned much about the vital role of dolichols and it is time to share it with you. I have been talking of the consequences of statin associated dolichol inhibition for years now, calling attention to the importance of this substance in neuropeptide formation and our feelings of thought, sensation and emotion. More recently, I have pointed at dolichol inhibition as a possible cause of our statin associated behavioral side effects, such as irritability, hostility and depression, while wondering how, with so few proteins, such amazing subtlety of emotion could be created. Now, however, I have learned that along with peptide assembly within the endoplasmic reticulum of every cell is the process of sacharride attachment. It is here in the heart of every cell that our saccharides (sugars) are attached to proteins to give a far broader range of diversity and information transfer than protein alone. This process is called glycosylation and it demands a ready supply of dolichol. No longer do we consider our sugars as just simple fuel. The effects of these eight vital sugars on the resulting peptide structure being created in the endoplasmic reticulum and companion piece, the Golgi apparatus, is just short of miraculous. And this attachment of sugars, this glycosylation, is completely dependent on dolichol's orchestration. Throw in a statin and what do you have - an inevitable inhibition of dolichol (roughly comparable to the degree of cholesterol inhibition). The resulting effect upon our body of this dolichol theft is completely unpredictable for this is at the very center of cell communication and immunodefense. Dolichols may well be fully as important as CoQ10 in this unfortunate game of statin roulette that Big Pharma has placed us in. Statin damage is often additive to pre-existing impairment of glycolysis from aging, disease and poor nutrition. Glyconutrients, now increasingly available as a source of these vital sugars, may offer hope to thousands of statin damaged victims to help the body repair the effects of impaired glycolysis. It is much too early to talk of proof of effect for studies are only now in the planning stage. However, based upon my six years of research, I have an intuitive feeling of success and anxiously look forward to the results. Perhaps the most important observation to come out of the latest recommendation from the Heart Association is what it did not say about the use of statins in children. First and foremost is the evidence just reported in the New England Journal of Medicine by Edison, R and Muenke, M of babies born with severe malformations from first semester statin exposure. This report more than any other serves to rip apart the American Heart Association's newest guidelines before the ink has dried on the paper. These authors reviewed FDA records, (Remember my earlier reports of the complete inadequacy of FDA's Medwatch program of adverse events � for years reports of statin associated transient global amnesia just lay there apparently unseen by human eyes until Wagstaff and others reported 60 cases in their 2003 screening, belatedly telling doctors the world over that, "Yes, statins do cause amnesia.") the same records used by Wagstaff, from the period 1987 to 2001, of first trimester exposure to statins and found that 20 of the 52 babies born in this time period had serious congenital anomalies, including severe central nervous system defects and malformed limbs. Nearly half of the exposed babies had these severe anomalies. Even though the numbers may be small, the ratio of abnormal to normal speaks of extraordinarily potent mutagenic effects from statin use. You remember thalidomide? This is in the same ballpark! Now we are talking about screening children for cholesterol with the use of statins to keep their cholesterol down to below 190 or 160, if other risk factors co-exist. These children are physiologically the same as these embryos, just a little older and about to be exposed to reductase inhibitors, known as statins. This introduces the second major item the American Heart Association failed to mention � how little our physicians and pharmacists (and our drug companies) really know about the mechanism of action of the statin class of drugs. I can assure you that if the people who promulgate these guideline had the slightest awareness of what reductase inhibition really means they would be far more conservative in their thinking. After six years of research on statin mechanisms the figures for congenital anomalies just released do not surprise me. Historically, our statins were designed to function on one level � that of decreasing the synthesis of cholesterol through reductase inhibition of the mevalonate metabolic pathway. I'll bet not one physician in a hundred understands the consequences of this. Most of it was not even taught when we were medical students and if it had been taught, the light of awareness would have dimmed considerably by the time of graduation and progressively extinguished over the next few years, for it is not a subject dealt with frequently by we clinicians. I am talking here of the impact of cholesterol synthesis inhibition on our glial cells � sole source of our vital synaptic cholesterol without which cognition falters. And I am talking of girding the mevalonate tree with our statins so that our CoQ10 and dolichols are depleted to about the same degree as our cholesterol. And I am talking of enhancement of tau protein production by statin's interference of the normal phosphorylation pathways and about inhibited selenoprotein inhibition. All of this is the inevitable result of reductase inhibition and any physician not thoroughly understanding this should review, if he expects to prescribe statins in an enlightened manner. There is sufficient in what I have just listed to provoke caution in prescribing to adults say nothing of children for who among us really understands the consequences of long-term inhibition of these vital functions when we do not yet understand their effect in our body? But there is more, much more. Only in the past five years have we become aware of statins other role, that of anti-inflammation. Ora Shovman said it first in his "Anti-inflammatory and immunomodulatory properties of statins" in Immuno Res in 2002 but we already expected it from the results of our longitudinal studies. Atherosclerosis is an inflammatory process. Statins reduce cardiovascular risk by their potent anti-inflammatory effect. Cholesterol lowering is irrelevant. Statin do this by their ability to inhibit nuclear factor kappa B (NF-kB), a transcriptase common to our entire immunodefense system. They work on atherosclerosis because NF-kB promotes smooth muscle migration, lymphocyte adhesion, macrophage attraction and platelet activation. This remarkable property is an example of serendipity at work. The makers of our statin drugs had not the slighest idea this would result. Since NF-kB is the key to our infectious disease and cancer defense as well as ridding the body of unfavorable mutations from whatever source, is it not predictable that this previously unknown statin effect is likely the one reponsible for the anomalies in our developing fetuses? I cannot completely dismiss a possible role for dolichol, tau protein or selenoprotein because we don't as yet know sufficiently about them but intuitively I would bet on NF-kB inhibition. Patients, please make certain your doctor understands this when about to make a judgment about the use of statins in your child and doctors please be certain that the national "leaders" in charge of promulgating statin use guidelines thoroughly understand the above. Do not expect anyone in FDA to counsel you correctly. You must choose your leaders carefully. How can I forward articles,or the whole site,to friends? I believe forwarding the whole site would be a bit much. Of course you can tell someone about the URL (the address in the top of the browser window) so they can look themselves. If you want to email an article, try clicking on the page with the right mouse button (control - click if you have a mac) and select the option "save page as". I have enjoyed reading your articles - they are to the point and very well written. I see you have a link to Al Sears whose site is always of interest. I wonder if you would consider looking at my site and possibly linking to it for your visitors. My articles on diabetes, ADHD and Osteoporosis are well researched and fully referenced. Which is why I have fewer articles than I would like as they take a lot of time. Also, the site is still less than a year old at present. I know I have only a 2 rank at present but no harm in asking.